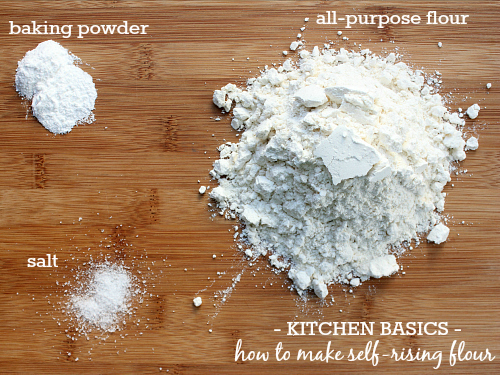 next in our kitchen basics series, we're taking a look at self-rising flour. self-rising flour is nothing more than flour with a leavening agent (baking powder) and salt in it. when recipes call for self-rising flour, they don't call for an additional leavening agent since the baking power is already in the self-rising flour. instead of keeping a container of self-rising flour in your kitchen, it is easy to just make your own as you need it. you only need three ingredients: all-purpose flour, baking powder, and salt. sift the three ingredients together 2 times. this will incorporate the baking powder into the flour and aerate the flour. voila! homemade self-rising flour! Good tip to know. Many recipes call for self-rising flour and this would not have a high sodium count.